If you have an alarm on our house, and have never switched it on, then this piece of kit is for you. Why would you have an alarm, but not use it we hear some of you ask? Because you have cats (or other pets), and as soon as you do, the furry critters set it off and all havoc breaks lose. Thankfully, due to the wonders of modern technology, there is a solution to “the pet situation” and we have been lucky enough to undertake a Somfy One review to see if it really does help bring home alarms into the modern era. What is the Somfy One? Sound an alarm if there is an intruder: It will alert you to any intrusions, as well as sounding an alarm and connecting to a phone number when that alarm is tripped. You input the phone number it connects too of course. The device is so simple to set up – we managed it in five minutes; all that is required is for you to follow the on-screen instructions within the Somfy Protect app (iTunes/Google Play), and you are good to go. The app enables you to connect remotely to the camera, and to configure the device as you choose. You can also pay for a subscription service which allows you to record through the device; though we haven’t opted for this as yet. It would likely be helpful for commercial premises, as an alternative to CCTV perhaps? There are various add ons to the system, including additional sensors for windows, as well as a key fob which helps you know when the kids or your partner have arrived home. What did we think of the Somfy One? This is a wonderful idea, and at £229 (£199 on Amazon), it is a pretty affordable solution to home security. Alarm systems are extremely expensive, and can easily set you back over £400; this provides a simpler, and lower cost alternative. Adds ons; such as the window sensors and key fob, do add extra costs to the system. 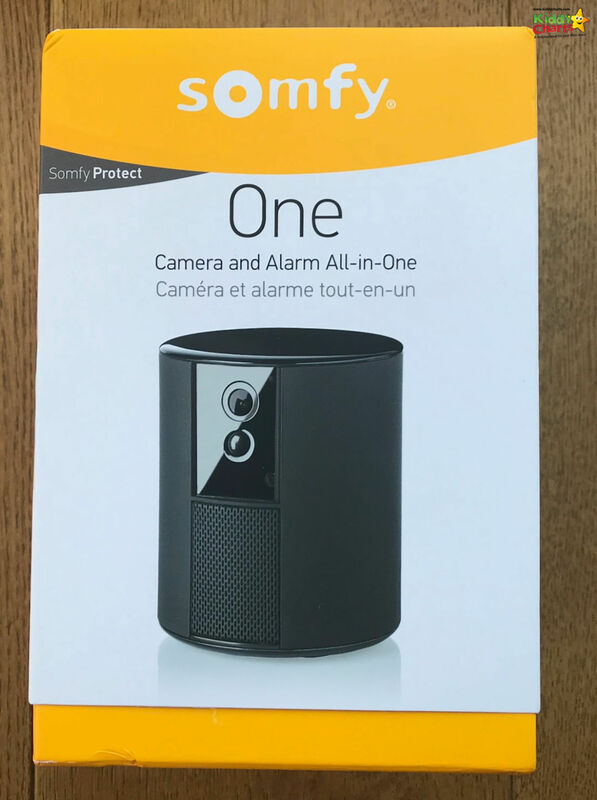 If you are after a home security option that takes little time to set up, and is simple to use; then Somfy One is a great solution. It is not a complete alarm system though, and shouldn’t be bought as such. It is more for peace of mind than total home security. The app most definitely helps with the cats and the alarm problem. 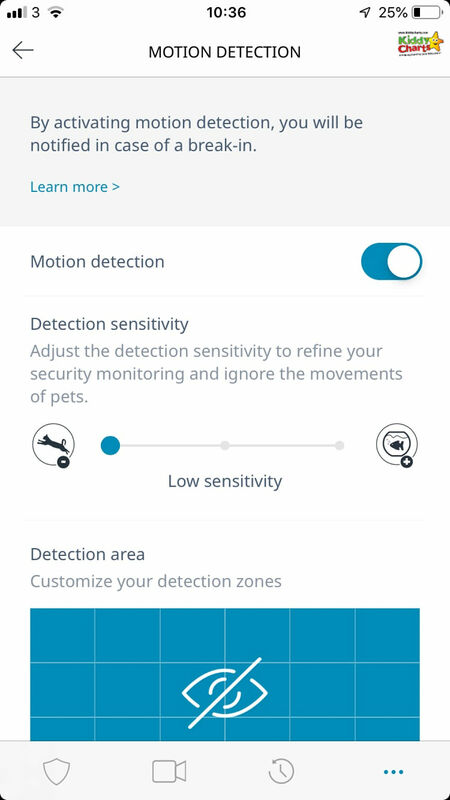 It has a very helpful sensitivity setting for those of us that have pets, and this has enabled us to use it while we were out, without fear that the cats are going to set the sensor, and more importantly the siren (!) off while we are out of the house. Not sure our neighbours would be too happy about that….. The camera is so easy to access through the app, we found ourselves checking it from time to time just to make sure everything was OK; which really does give you peace of mind as it is 5 seconds to monitor it all. It is potentially a solution for parents to check up on their kids when are out, and there is a babysitter. Parents can use the camera function and happily keep an eye on the baby/toddler while they were away. Obviously, parents would know there was a sitter in the house, but it just provides a little more re-assurance. Something that would be welcome by many, particularly first time parents. We all know how anxious the modern parent can get, and the Somfy One enables a total security and web cam solution for your kids bedroom. When you set up the Somfy One, It is important to choose where you locate the device well. There is advice in the set up process on this. It is worth taking time to think about the layout of your house because you place the decide. You want to make sure it is positioned where it will detect an intrusion, but won’t be affected too much by the pets (if you have them). This is a good alternative for those seeking an easy all in one smart security solution. It is relatively basic though, so if you want something sophisticated, you are better going for the home security solution from the same provider, or spreading the net a little wider. It take little time to set up, and the controls are easy to use; it is also nice and sleek looking too. Overall, a good investment at the lower end of the security market, with the added bonus of doubling up as a spy cam for your kids! We hope that you enjoyed this review. If you like our content, why not check out our printables, or even better sign up for our newsletter? We would really like it if you came back to see us again. Thanks so much.